During WW-2 I spent two months in the 17th General Hospital (US Army which I believe was in the Vomero section of Naples, set high overlooking the bay and an exquisite view of Vesuvius. From the balconies you had a picture postcard scene in view. Is the hospital still there? If you know, what is its name now? I didn’t know the answer, but that note was from one Fred Hellman and led to his contribution to the WWII Oral History items in these pages. It also set me to finding out about a bit of history of hospitals in Naples, including the one that Fred had asked about, the Antonio Cardarelli hospital (pictured, right). Depending on how one defines “modern,” the first great wave of modern hospital building in Naples was an outgrowth of the Spanish incorporation of Naples as a vicerealm in the 1500s. Some of those hospitals still function today (the “Incurabili”, for example). Using a more modern definition of “modern,” in the early 1900s a section of the western end of the historic center of Naples (near the church of San Pietro a Maiella) was cleared to make room for the new Policlinic Hospital—now called (of course!) 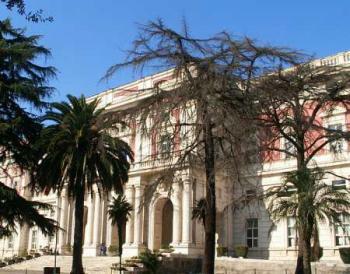 the "old" Policlinic Hospital. Today, however, the “hospital section” of Naples refers to the great number of hospitals in the “high Vomero” section of the city, way up on the hill on the way to the Camaldoli convent, a section of Naples that was countryside until the twentieth century. The major facility up there is the university clinic, a mini-city known as the New Policlinic, opened in 1973. The first major modern hospital in that area, however, is the one that Fred asked about—the Cardarelli. 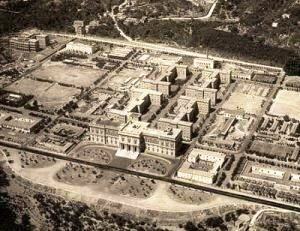 Construction of the Cardarelli hospital (on a 28 hectare site—about 70 acres) was started in 1927. The architect was Alessandro Rimini. The Nuovo Ospedale Moderno di Napoli (The New Modern Hospital of Naples) was called, more simply, "The 23 Marzo" (March 23rd, the day on which the Fascist Party was founded in 1919 by Mussolini). It was opened in 1934. 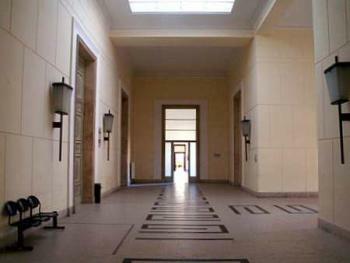 The entire grounds, themselves, with various out-structures dedicated to different specialties, were completed in 1939/40. The life of the architect, Antonio Rimini, was dramatically shaped by war. He was born in 1898 in Palermo and studied art in Venice at the Academy of Fine Arts. He gave up his studies because of World War I, a war in which he was taken prisoner. He survived the life of a POW in Germany by bartering his sketches of other prisoners for food. He finally escaped to Holland. (He said of his wartime experiences, “I owe my life to my art.”) In the early 1920s, he got a degree in architecture and dedicated himself to the restoration of monuments, churches and other buildings. He quit that in the mid-1920s and went into free-lance architecture. Besides the Cardarelli hospital in Naples in 1927, he designed Milan's first skyscraper, the S. Babila building, in Milan (1936) as well as a number of other buildings in that city. Rimini, however, was a Jew and thus excluded from his professional guild in 1938 by the Fascist racial laws. He was arrested by the German SS in 1944 and interned at the camp in Santa’Agata Fossili in the extreme north of Italy. Then, however, he was put on a train bound for Auschwitz. The good news is that once again his art saved his life; he used his artistic skills to dummy up an arm-band that identified him as a member of the Italian police (the north was still Fascist at the time); he then brazened his way past his captors, got off the train and escaped to freedom. He hid out in Milan under a false name until war’s end. He took up his architecture again, deserting it in 1955 for painting, his real love. He died in Genova in 1976. The Cardarelli hospital put on a Rimini exposition in 1997 on the occasion of the 50th anniversary of the founding of the hospital.